If you read this blog, you probably like being out-of-doors. Chances are, your love of the natural world began early – when someone took you outside and shared their love of gardens, parks or wild places. Childhood exposure to nature awakens something deep – our sense of connection with the earth and its creatures. A true sense of belonging - to a ecosystem greater than family or neighborhood - begins when we are young. So does the feeling of serenity that many of us experience when out in nature. Nature completes us, making us whole, centered, compassionate and more human. So make a pledge this Earth Day: take a child outdoors in the next month. It can be any child – your child/grandchild, niece or nephew, student, neighbor or some other child you know. 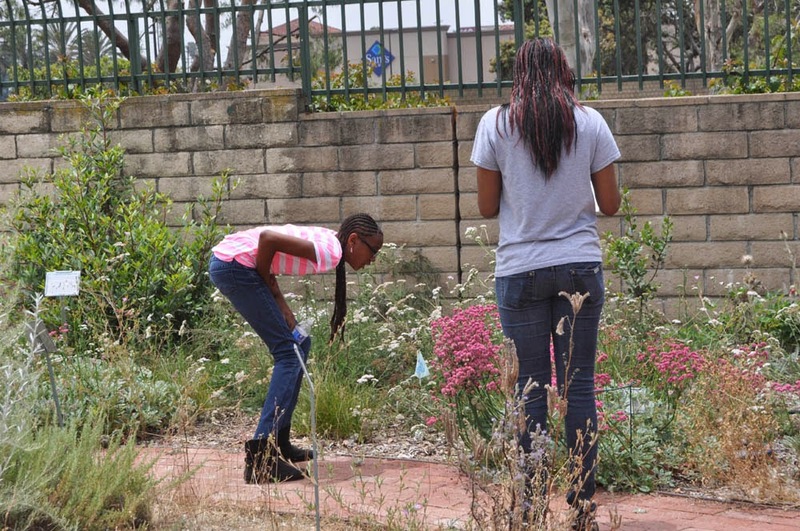 You don’t have to go far: your garden, a nearby park or natural area will do. The place needn’t be large or fancy; it just needs to be outdoors. Point out some interesting plants. Watch birds or insects as they go about their day. Explore the creatures that live in the soil or fallen leaves. Watch clouds go by, rain fall or the sun shine. Notice the patterns of the land. Share a sense of wonder – of belonging to something bigger than ourselves. Listen to the sound of the earth singing. Earth Day reminds us each year to take time for the important things in life. So, take a child outside for Earth Day. It’s essential - they are the earth’s future. Most gardens, even those of modest size, need a shrub or two; and California natives can be a good choice. Many are water-wise and most have interesting flowers, fruit or foliage. Of importance to busy gardeners, many are also quite easy to maintain (once they’ve been coaxed to an attractive shape in adolescence). Gardens in our area are continually enriched by their inclusion of native shrubs. One point to be aware of is size. Native shrubs come in all sizes – from small to very large. Before choosing a shrub, seriously consider its mature size. Yes, it really will get that big – maybe even a little bigger. And it will likely be difficult to keep it smaller. Choose the right size shrub for your space; then you and your shrub will be happy for years to come. California coffeeberry (Frangula californica; formerly Rhamnus californica) is one of the better native shrubs for the home garden. The species itself is large – to 8-12 ft tall and about as wide under favorable conditions. This is big, although it can be hedge-pruned to somewhat smaller if you’re willing to do the work. Fortunately, there are several smaller cultivars (discussed below) which may be just right for your space and garden design. Coffeeberries are members of the Buckthorn family (Rhamnaceae) which includes the Ceanothus, the Redberries (genus Rhamnus) and other plants more common to the sub-tropics and tropics. The plants are known for their flowers, which grow in parts of 5 (occasionally 4) and have a distinctive star-like shape. Many of the California species are used as garden shrubs. California coffeeberry is native from southern Oregon to Baja California, Mexico. It grows in the Santa Monica and San Gabriel Mountains of Los Angeles County, and even occurs in the foothills of Nevada and Arizona. It’s most often found at lower elevations (below about 3500 ft.) but extends to 5000 ft in some locations. In the northern parts of its range, Coffeeberry usually grows on drier slopes. In warmer regions like S. California, look for it on north-facing slopes and in shady canyons, often near streams. Coffeeberries grow in areas that experience periodic fires. They have specially adapted root-crowns that contain dormant buds. These buds sprout after a fire (or after the plant is coppiced (cut down nearly to the ground) allowing them to recover quickly after a fire. The post-burn growth rate can be amazingly fast! There are several subspecies of California coffeeberry, including three from Los Angeles County. The more common Frangula californica ssp. californica has a statewide distribution in western California (including the northern California coast) and is the most common type sold in native plant nurseries. It’s well-loved by gardeners for its shiny, evergreen, medium-green foliage. Subspecies californica grows in a number of plant communities including Chaparral, Coastal Sage Scrub, Coastal Strand, Mixed-evergreen Forest, Northern Coastal Sage Scrub, Redwood Forest and Central Oak Woodland. Frangula californica ssp. tomentella is found occasionally in the Santa Monica, San Gabriel and Tehachipi mountains as well as in California’s Central/Northern coastal foothills and those of the western Sierras. The leaf color in this subspecies is an attractive, matt (not glossy) blue-green; the leaves are usually more elongated and the undersides are densely hairy. This subspecies is often available in nurseries, though it’s less common than subspecies californica. The less widely distributed Frangula californica ssp. cuspidata grows in desert chaparral, desert scrub and woodlands of the eastern Sierra, Tehachapi, San Jacinto and Transverse mountain ranges of Central and Southern California. This desert-adapted species also has leaves with short dense hairs (primarily on the underside) and a gray-green appearance. It is occasionally offered by local native plant nurseries, particularly those that cater to clients from desert areas. In this posting we’ll focus on Frangula californica ssp. californica, as it is routinely available at native plant nurseries and we have two of them in our mixed hedgerow in Mother Nature’s Backyard. California coffeeberry is a large shrub or occasionally a small tree. Under favorable conditions it can grow fairly quickly to 4-6 ft tall and wide, then more slowly to 8-12 ft. The photo above shows one of our Coffeeberries at one and two years after planting as a one-gallon plant. As can be seen, it has already developed a nice, rounded shape with very little pruning. The leaves of Frangula californica ssp. californica are evergreen, simple and pleasant to the eye. Leaves are 1 ½ to 4 inches long, alternate, and shiny above, with edges that may be straight or slightly serrated. The leaf margins roll under slightly when the plant is drought stressed. As seen in the photo below, new leaves are a very light green; older leaves become darker. This shrub makes a nice green backdrop for colorful flowers and plants with light colored foliage. Coffeeberry is many-branched, forming a dense rounded form, particularly when clipped occasionally (by wildlife or gardeners). The young bark is usually red-brown, becoming gray with age. The dense growth habit makes it an excellent candidate for a hedge/hedgerow shrub or foundation planting. Plants reach their maximum size in 15-20 years. In the wilds, plants are often long-lived – to at least several hundred years old. Coffeeberries bloom in spring over much of their range. In our area, they bloom as early as March and can continue into May. The flowers are inconspicuous. In fact the first thing you may notice is a cloud of pollinators swarming around them! Coffeeberry flowers are perfect (contain both male and female organs), small (~ ¼ inch) and pale yellow-green to white (see photo above). The flowers are in parts of 5, typical for the Buckthorn family. Coffeeberries, like the Ceanothus, are insect pollinated. They attract a great number and range of pollinators including European honey bees, native bees (usually the smaller species), pollinator flies and others. The pollinators are a joy to watch – and the show goes on for 3-4 weeks. In our experience, the pollinators are so focused on the flowers they pretty much ignore passing – and even photo snapping - humans. While Coffeeberry flowers are inconspicuous, their fruits are anything but! Coffeeberries produce rounded, berry-like drupes (fleshy fruits with a stony pit) that are ¼ to ½ inch in diameter. Fruits are green in late spring, turning to yellow, red and almost black through summer/fall as they ripen. Fruits of several colors at the same time are common, making for quite a show! Fruits contain two hard-coated seeds which resemble coffee beans (hence the common name). Contrary to their appearance, they don’t make a great coffee substitute. Although occasionally eaten by Native Californians, the fruits have strong laxative properties are not really edible for humans. But birds - even animals - eat them with gusto. Birds are the primary seed dispersers and they do a good job; in the wild, few seedlings develop near parent plants. Robins, Finches, Towhees, Mockingbirds and Jays all eat the fruit. In fact, one of the reasons we included Coffeeberry in our hedgerow was to attract these bird species. Plants begin producing at 2-3 years of age, so you’ll have fruits within several years of planting. Coffeeberry is quite adaptable to garden conditions. It thrives in most local soils, from sandy to clay, as long as it’s watered properly. It can be grown in full sun to part-shade and is fairly drought tolerant once established. Coffeeberries, including the cultivars, are good choices when a part-shade tolerant shrub or groundcover is needed; for example under tall trees or to the east or north of large trees or walls. In our warmer S. California gardens, Coffeeberry is often at its best under such conditions. In our area, Coffeeberries benefit from occasional deep watering during summer (Water Zone 2 is probably best; see http://mother-natures-backyard.blogspot.com/2012/04/water-wise-gardening-tip-save-water.html ). Be sure that the soil is dry at a depth of 4 inches before watering – and water during a cooler spell, in early morning or late in the day. Coffeeberries like an organic mulch (see http://mother-natures-backyard.blogspot.com/2012/07/understanding-mulches_23.html for more on mulches). Coffeeberries have a nice natural shape and appear pruned even without any pruning. They can be shaped for hedging – just a light trimming during the growing season to create a semi-formal hedge. The more open cultivars – like ‘Bonita Linda’ – can even be trimmed up to make an interesting small tree. 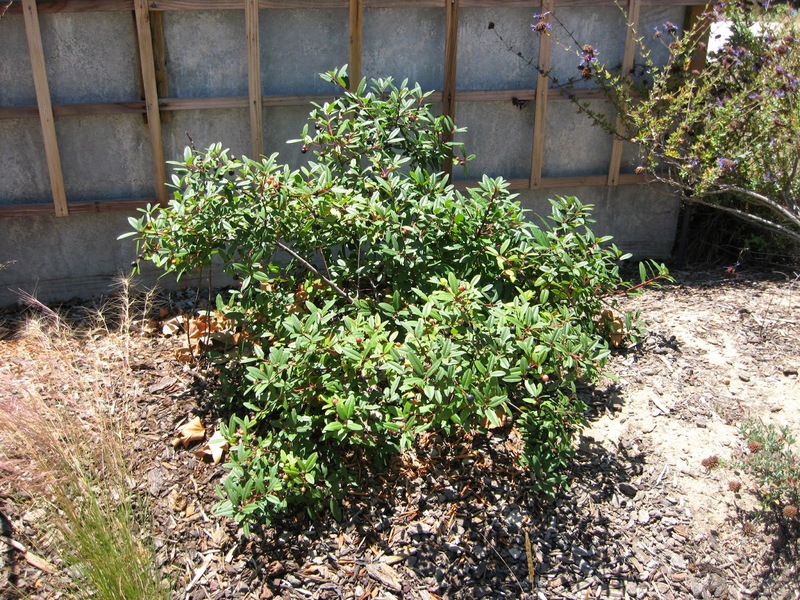 Of course the most common use for Coffeeberry is as a background or accent shrub in water-wise gardens. It is a good alternative to commonly used non-native shrubs like Carissa, Cotoneaster, Elaeagnus angustifolia (Russian olive), Myoporum laetum (ngaio tree); Ligustrum, Myoporum, Oleander, Photinia, Pittosporum, Raphiolepis and Xylosma. 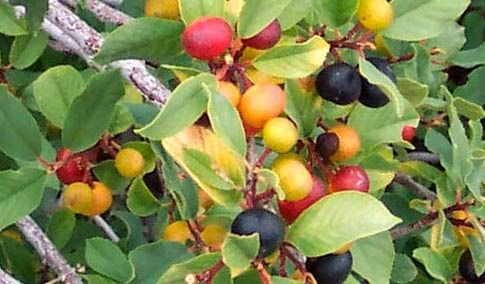 Coffeeberries can be combined with other native shrubs that share similar water requirements. Some good companion shrubs/trees include Chaparral whitethorn (Ceanothus leucodermis), Toyon (Heteromeles arbutifolia), Sourberry (Rhus trilobata) and the Redberries (Rhamnus crocea). 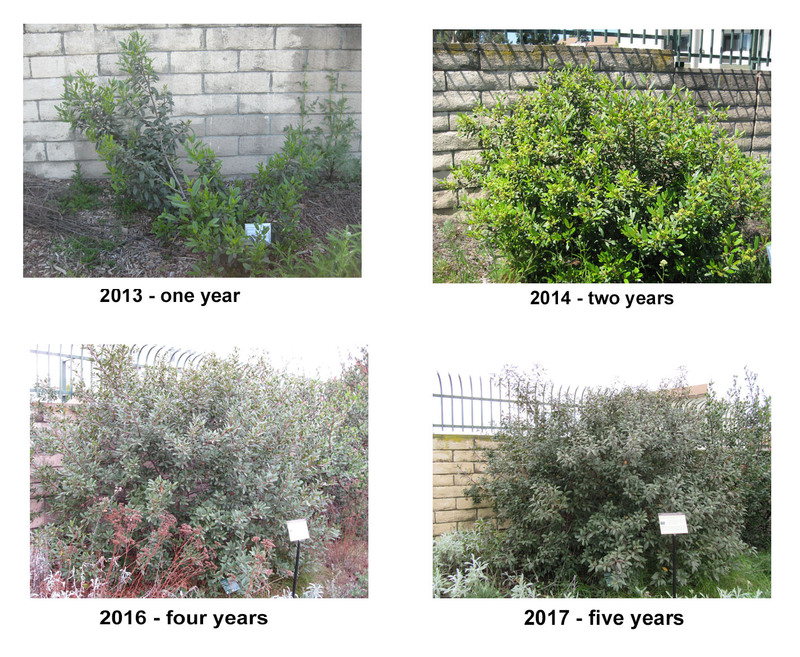 The more drought-tolerant cultivars – and the species – can even be grown under native oaks like coast live oak (Quercus agrifolia). Several excellent cultivars are available. The smallest of these is Rhamnus californica ‘Little Sur’, a very dense, compact (dwarf) shrub that grows only 3-4 ft tall and wide. This is probably the best choice for smaller hedges and for containers. It is particularly well suited to coastal areas. Cultivars ‘Seaview’ and ‘Seaview Improved’ are very low-growing (to about 2 ft.) and spreading. They make an interesting groundcover shrub. Several cultivars are only slightly smaller than the species – but enough so to make them good garden candidates. Rhamnus californica 'Eve Case' is widely available in California native plant nurseries. ‘Eve Case’ grows more slowly than the species, becoming 6-8 ft. tall at maturity, but more commonly about 6 ft. tall and wide. 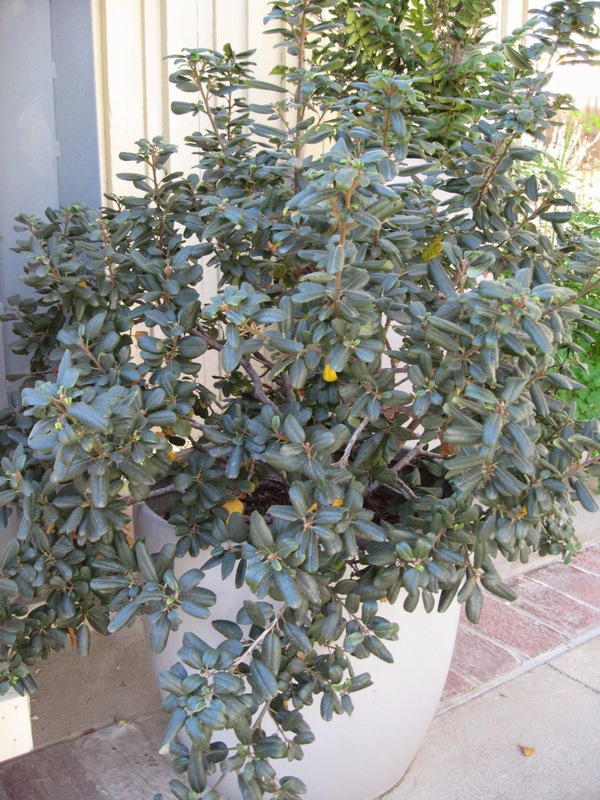 It is very drought tolerant, does well in coastal gardens and is probably the most commonly garden Coffeeberry. It has all the good attributes of the species and has been used in gardens since the 1970’s. Rhamnus californica 'Leatherleaf' is a 6-8 ft cultivar with very dark green leaves and a mounded growth habit, becoming broader with age. It takes a bit more water and likes a little shade in our area. Rhamnus californica 'Mound San Bruno' also has a mounded shape. It grows to 4-6 ft tall and 8-15 ft. wide; it makes a good tall groundcover under trees and on north-facing slopes. Both of these cultivars are less frequently available in Southern California nurseries. Rhamnus californica 'Bonita Linda' is a large cultivar (8-10 ft tall and wide) with a more open growth habit and gray-green foliage. It is used like the species – for large background shrub or as a screen or hedge. It is probably the best candidate for pruning up into a small tree. It does well in S. California gardens and can be watered several times a month in summer if desired. It is commonly available in S. California native plant nurseries. 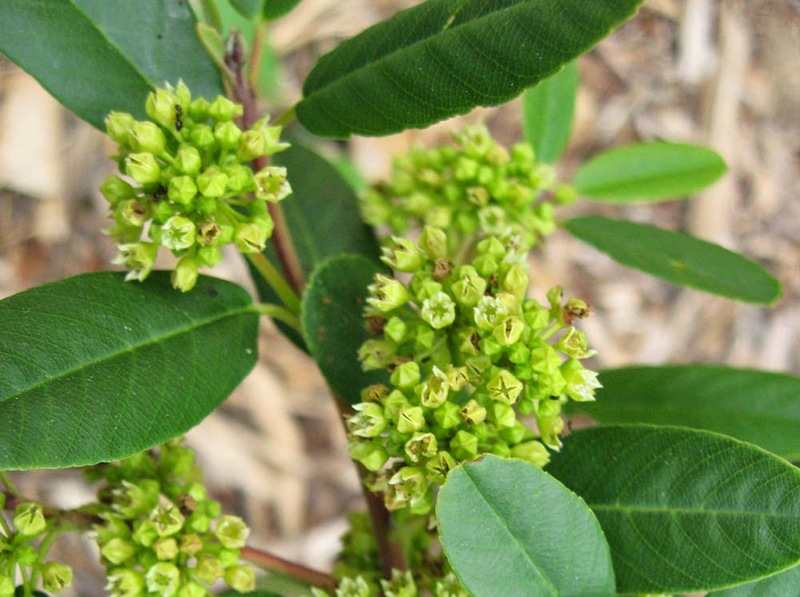 Native Californians used a preparation from the bark of California coffeeberry as a laxative. It is very powerful and requires careful preparation and use. While not well known as a dye plant, the foliage can be used to make a golden dye, which is more intense when plant materials are collected in fall. In summary, California coffeeberry is a wonderful shrub with great habitat potential. It looks like a garden shrub, is evergreen and water-wise. In addition to the species, there are cultivars that range in size from small to large. We hope you’re inspired to consider this wonderful native shrub in your garden. And do take a look at ours when you come to the garden.